« Has @JBTecDS Effectively Defected To @Signagelive? MALE, young 49, likes food, wine, digital signage, comedy, evenings in/out, outdoor media, tangerine dream, travelling, WLTM warm, considerate speakers, any YO, NS, the more foreign the better, GSOH. 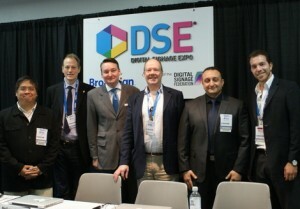 That’s right we’re looking for ‘International Speakers’ for the Digital Signage 360 Event at #dse2013 next February. The event is officially dubbed the second annual Digital Signage 360: A Global Perspective event and it aims to build on the success we had in 2012 (the 2012 speakers are shown here on the right). Once again we aim to put excellent speakers (from several different continents) in front of a full room of foreign types and those looking to network with said ‘international community’. Richard Lebovitz, Editorial Director at Digital Signage Expo and I are looking for presentations for this half-day international conference that will provide insight on the state of the industry and business opportunities in your country or region. The goal of Digital Signage 360 is, as always, to provide technology providers, systems integrators, network owners, network operators and advertising agency executives an overview of the opportunities, challenges and achievements in the use of digital signage and digital out-of-home networks around the world. The event, which will cover EMEA (Europe, Middle East and Africa), BRIC (Brazil, Russia, India and China) and the Pacific Rim, will provide an ideal opportunity for anyone looking to network and do business outside their current region. For more information about presenting at DSE or to download a presentation proposal form, click here. This entry was posted on Tuesday, July 3rd, 2012 at 19:12 @842 and is filed under DailyDOOH Update. You can follow any responses to this entry through the RSS 2.0 feed. You can leave a response, or trackback from your own site.